Hastelloy Din 2.4819 Spool Pipe Fittings Suppliers at Qatar, Hastelloy C276 Spool Pipe Fittings, Alloy C276 Spool Pipe Fittings Manufacturig at Tanzania, Nickel Alloy C276 Spool Pipe Fittings, Inconel C276 Spool Pipe Fittings Supplies at Italy, Hastelloy C276 Spool Tube Fittings, Nickel Alloy C276 Spool Tube Fittings, Inconel C276 Spool Tube Fittings Supplier & Exporter in Mumbai India. Alpha Overseas is a known stockist and trader that offer a wide range of Hastelloy C276 Spool Pipe Fittings, which is balanced to provide excellent corrosion resistance to a variety of chemical process environments. Alloy C276 Spool Pipe Fittings resists formation of grain-boundary precipitates and is therefore suitable for chemical process applications in the as-welded condition. Nickel Alloy C276 Spool Pipe Fittings displays excellent resistance to pitting and crevice corrosion, stress corrosion cracking and oxidising atmospheres up to 1040 Degree C. The benefits of Hastelloy C276 Spool Pipe Fittings process equipment include high resistance to uniform attack, excellent stress corrosion cracking resistance, ease of welding and fabrication, outstanding localized corrosion resistance. Hastelloy C276 Spool Tube Fittings has exceptional resistance to strong solutions of oxidizing salts, such as cupric and ferric chlorides. 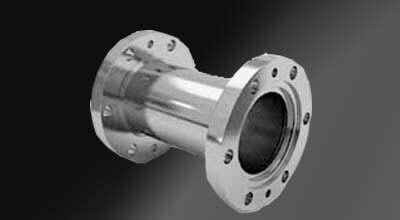 Nickel Alloy C276 Spool Tube Fittings is almost anything being used around sulphuric acid (evaporators, filters, heat exchangers, and mixers), along with digesters and bleach plants for the manufacturing of paper and pulp. ASTM SB 336 Hastelloy Spool Fittings, Hastelloy C276 Spool Fittings Supplies at Turkey, ASTM C276 Spool Fittings, Hastelloy SB 564 Spool Fittings Mnufacturing at Spain, ASTM SB160 Spool Fittings, UNS N10276 Spool Fittings, ASTM SB 472 UNS N10276 Spool Fittings Leading Manufacturer & Stockist in Mumbai, India. Inconel C276 Spool Tube Fittings is also used in Pollution control, Waste treatment, Chemical processing, Marine engineering, and so on. Hastelloy UNS N10276 Spool Pipe Fittings maintains very good corrosion resistance in a broad variety of chemical process and aqueous environments. The limiting factor when dealing with strong oxidizing environments is the low Cr content in Hastelloy Din 2.4819 Spool Pipe Fittings, which means that hot and concentrated nitric acid environments are NOT desirable. Standard : ASTM / ASME SB 336 / ASTM / ASME SB 564 / 160 / 472. Hastelloy C276 is applied in Chemical Processing and Food Processing Plants. A Wide Range Of the Best Quality Hastelloy C276 pipe spool definition, Hastelloy C276 pipe spool piece, Hastelloy C276 pipe spool fabrication shop, Hastelloy C276 pipe spool image, Hastelloy C276 pipe spool wiki, Hastelloy C276 pipe spool manufacturers, Hastelloy C276 pipe spool drawing, Hastelloy C276 pipe spool fabrication drawing, Hastelloy C276 tri clamp sanitary spools, Hastelloy C276 stainless steel tri clamp spool, Hastelloy C276 spool pipe, Hastelloy C276 pipe spool piece,Hastelloy C276 jacketed sanitary spool, Hastelloy C276 pipe spool image, 1.5" sanitary spool, Hastelloy C276 pipe spool drawing standards, Hastelloy C276 pipe spool fabrication drawing, pipe spool fabrication shop, Hastelloy C276 pipe spool wiki, pipe spool manufacturers, Hastelloy C276 pipe spool hs code, Hastelloy Alloy spool piece Manufacturer, Supplier in India. We are Exporter of Hastelloy C276 Spool Fittings in Worldwide Such as India, Sweden, South Africa, Nigeria, Ireland, Denmark, Philippines, Saudi Arabia, Bhutan, Croatia, Singapore, Kenya, Hong Kong, Austria, Iran, Nepal, Kuwait, Jordan, Indonesia, Vietnam, Gabon, Australia, Bangladesh, Algeria, Libya, Spain, Colombia, Yemen, Slovakia, Namibia, Chile, Netherlands, United Kingdom, Italy, Turkey, Israel, Costa Rica, Iraq, Peru, Canada, Afghanistan, Russia, Nigeria, United States, Bulgaria, France, Greece, Germany, Oman, Poland, Iran, Ecuador, Qatar, Tibet, Belgium, Finland, Thailand, Czech Republic, Venezuela, Mexico, Kazakhstan, Egypt, Morocco, Zimbabwe, Ukraine, Bahrain, Norway, Lithuania, Angola, Taiwan, Macau, United Arab Emirates, Serbia, Pakistan, Brazil, Sri Lanka, Azerbaijan, Switzerland, Mongolia, Poland, Ghana, Malaysia, Bolivia, Gambia, Estonia, China, Hungary, Trinidad & Tobago,Tunisia, Argentina, Puerto Rico, Romania, South Korea, Japan, Mexico, Chile, Portugal, Belarus, Lebanon, New Zealand. We are Suppliers of Hastelloy C276 Spool Fittings in India Such as Mumbai, Ahmedabad, Hanoi, Thiruvananthapuram, Navi Mumbai, Manama, Granada, Los Angeles, Noida, Pimpri-Chinchwad, Moscow, Kuala Lumpur, Dubai, Pune, Doha, Ankara, Thane, Tehran, Bengaluru, Secunderabad, Gurgaon, Riyadh, Al Jubail, Lahore, Courbevoie, New Delhi, Mexico City, Aberdeen, Houston, Ludhiana, Atyrau, Ernakulam, New York, Geoje-si, Rajkot, Rio de Janeiro, Ulsan, Hong Kong, Petaling Jaya, Bhopal, Haryana, Dallas, Perth, Vung Tau, Jeddah, Chennai, Edmonton, Port-of-Spain, Coimbatore, Kolkata, Milan, La Victoria, Kuwait City, Bogota, Chiyoda, Muscat, Madrid, Istanbul, Karachi, Ranchi, Nashik, Lagos, Santiago, Singapore, Kanpur, Jakarta, Visakhapatnam, Brisbane, Jaipur, Baroda, Dammam, Jamshedpur, Howrah, Cairo, Seoul, Sydney, Vadodara, Bangkok, Faridabad, Chandigarh, Al Khobar, Caracas, Toronto, Nagpur, Abu Dhabi, London, Surat, Gimhae-si, Busan, Montreal, Sharjah, Ahvaz, Melbourne, Algiers, Hyderabad, Calgary, Indore, Ho Chi Minh City, Colombo.